Several of the temperature diagrams on this site begin in the year 1979, where the fine satellite record begins. This is chosen as a general start date to make comparison between different data sources (satellite, surface, etc.) easy. On the other hand, this approach may conceal the fact that Earth's climate record is much longer. It is the purpose of the present short paragraph to introduce modern climate change to this longer time perspective. Fig.1. Geological stratigraphic chart for the entire geological history of planet Earth. Modern time is indicated by the thin red line at the top of the left column. Please note that the time scale is highly compressed, and increasing so towards higher ages. The left hand column fits on top of the next column to the right, column no 2 on top of no 3, and the right hand column should be at the bottom. Planet Earth has an age of about 4600 million years. The diagram above (Subcommission for Stratigraphic Information) shows a geological stratigraphic chart for the entire geological history, subdivided into a vast number of epochs, each consisting of a number of stages. Most (if not all) of these geological divisions are based on the recognition of environmental changes affecting the entire planet; that is, past global climate changes. In other words, global climate change has been the rule for the entire history of Earth, not the exception. If each year in the time scale above (Fig.1) was represented by one millimetre, the entire stratigraphic chart would be about 4600 km (2858 miles) long. In Europe, this corresponds roughly to the distance between Madrid (Spain) to Sverdlovsk in the Ural Mountains (Russia). In North America 4600 km roughly corresponds to the distance between San Francisco (USA) and Quebec (Canada). On this scale modern humans would appear within the last 200 m, the Polar Bear within the last 150 m, and the entire global meteorological record since about 1850 would take up the last 16 cm. The period with satellite observations would fit into the final 3 cm. From time to time the planet has been affected by millions of years with relatively cold climate, each such period leading to a long succession of glacial and interglacial periods. During the last couple of millions of years, planet Earth has been in such a cold stage. The last (until now) ice age ended around 11,600 years ago, and we are for the time living in a so-called interglacial period, until the next ice age will begin some time into the future. The last four glacial periods and interglacial periods are shown in the diagram below (Fig.2), covering the last 420,000 years in Earth's climatic history. Fig.2. Reconstructed global temperature over the past 420,000 years based on the Vostok ice core from the Antarctica (Petit et al. 2001). The record spans over four glacial periods and five interglacials, including the present. The horizontal line indicates the modern temperature. The red square to the right indicates the time interval shown in greater detail in the following figure. The diagram above (Fig.2) shows a reconstruction of global temperature based on ice core analysis from the Antarctica. The present interglacial period (the Holocene) is seen to the right (red square). The preceding four interglacials are seen at about 125,000, 280,000, 325,000 and 415,000 years before now, with much longer glacial periods in between. All four previous interglacials are seen to be warmer (1-3oC) than the present. The typical length of a glacial period is about 100,000 years, while an interglacial period typical lasts for about 10-15,000 years. The present interglacial period has now lasted about 11,600 years. According to ice core analysis, the atmospheric CO2 concentrations during all four prior interglacials never rose above approximately 290 ppm; whereas the atmospheric CO2 concentration today stands above 400 ppm (by volume or molecular fraction, as of 2018). The present interglacial is about 2oC colder than the previous interglacial, even though the atmospheric CO2 concentration now is about 100 ppm higher. The last 11,000 years (red square in diagram above) of this climatic development is shown in greater detail in the diagram below (Fig.3), representing the main part of the present interglacial period. Fig.3. The upper panel shows the air temperature at the summit of the Greenland Ice Sheet, reconstructed by Alley (2000) from GISP2 ice core data. The time scale shows years before modern time. The rapid temperature rise to the left indicate the final part of the even more pronounced temperature increase following the last ice age. The temperature scale at the right hand side of the upper panel suggests a very approximate comparison with the global average temperature (see comment below). The GISP2 record ends around 1854, and the two graphs therefore ends here. There has since been an temperature increase to about the same level as during the Medieval Warm Period and to about 395 ppm for CO2. The small reddish bar in the lower right indicate the extension of the longest global temperature record (since 1850), based on meteorological observations (HadCRUT3). The lower panel shows the past atmospheric CO2 content, as found from the EPICA Dome C Ice Core in the Antarctic (Monnin et al. 2004). The Dome C atmospheric CO2 record ends in the year 1777. The diagram above (Fig.3) shows the major part of the present interglacial period, the Holocene, as seen from the summit of the Greenland Ice cap. The approximate positions of some warm historical periods are shown by the green bars, with intervening cold periods. Clearly Central Greenland temperature changes are not identical to global temperature changes. However, they do tend to reflect global temperature changes with a decadal-scale delay (Box et al. 2009), with the notable exception of the Antarctic region and adjoining parts of the Southern Hemisphere, which is more or less in opposite phase (Chylek et al. 2010) for variations shorter than ice-age cycles (Alley 2003). This is the background for the very approximate global temperature scale at the right hand side of the upper panel. Please also note that the temperature record ends in 1854 AD, and for that reason is not showing the post Little Ice Age temperature increase. In the younger part of the GISP2 temperature reconstruction the time resolution is around 10 years. Any comparison with measured temperatures should therefore be made done using averages over periods of similar lengths. During especially the last 4000 years the Greenland record is dominated by a trend towards gradually lower temperatures, presumably indicating the early stages of the coming ice age (Fig.3). In addition to this overall temperature decline, the development has also been characterised by a number of temperature peaks, with about 950-1000 year intervals. It may even be speculated if the present warm period fits into this overall scheme of natural variations? The past temperature changes show little (if any) relation to the past atmospheric CO2 content as shown in the lower panel of figure 3. Initially, until around 7000 yr before now, temperatures generally increase, even though the amount of atmospheric CO2 decreases. For the last 7000 years the temperature generally has been decreasing, even though the CO2 record now display an increasing trend. Neither is any of the marked 950-1000 year periodic temperature peaks associated with a corresponding CO2 increase. The general concentration of CO2 is low, wherefore the theoretical temperature response to changes in CO2 should be more pronounced than at higher concentrations, as the CO2 forcing on temperature is decreasing logarithmic with concentration. Nevertheless, no net effect of CO2 on temperature can be identified from the above diagram, and it is therefore obvious that significant climatic changes can occur without being controlled by atmospheric CO2. Other phenomena than atmospheric CO2 must have had the main control on global temperature for the last 11,000 years. The following diagram shows the period since 1850 (indicated by the reddish bar in the diagram above), where it is possible to estimate global temperature changes from meteorological observations (Fig.4). Fig.4. Global monthly average surface air temperature since 1850 according to Hadley CRUT, a cooperative effort between the Hadley Centre for Climate Prediction and Research and the University of East Anglia's Climatic Research Unit (CRU), UK. The blue line represents the monthly values. An introduction to the dataset has been published by Brohan et al. (2005). Base period: 1961-1990. Last month shown: December 2010. Last diagram update: 3 January 2011. Click here to download the entire series of estimated HadCRUT3 global monthly surface air temperatures since 1850. From figure 3 it is obvious that the global meteorological record (Fig.4) begins in the final part of the Little Ice Age, and thereby documents the following temperature increase, especially clear since about 1915. In other words, the temperature increase documented by meteorological records represents the temperature recovery following the cold Little Ice Age. The ongoing climate debate is essentially about this being mainly a natural temperature recovery, or caused by atmospheric CO2, especially for the time after 1975? It can, however, from figures 2, 3 and 4 be concluded that the temperature increase 1975-2000 is not unique when compared with past records, and that the net effect on temperature by atmospheric CO2 has been small or even absent (Fig.3). From all diagrams shown above the still very short time period covered by the fine satellite observations is obvious. The period since 1979 only covers the most recent example of global warming (ca.1977-2001), but no examples of the many previous periods of warming or cooling. This should prudently be borne in mind when interpreting the temperature record since 1979 only, such as shown in several of the diagrams found on this website. As mentioned above the time since 1979 would only take up the final 3 cm of the entire 4600 km long geological climatic record, if each year is represented by one millimetre. Click here to view the recent (daily) global satellite temperature (AMSU-A) at various altitudes in the atmosphere. You will need to have a recent version of JAVATM installed on your computer to make use of this facility kindly made available by Dr. Roy Spencer and Dr. Danny Braswell. If you receive an error message after clicking 'Draw graph', try downloading the latest version (free) of Java from java.com. Land surface temperature 7 April 2019 (degrees K = degrees C + 273.15), at 02 and 14 hr (UTM-time), respectively. White areas are oceans or land areas without data. Map source: NOAA. Please use this and this link if you want to see the original diagrams (NOAA 18) or want to check for more recent updates than shown above. Click here to see the recent sea surface temperatures. All temperature diagrams shown below have 1979 as starting year. This roughly marks the beginning of the recent period of global warming, after termination of the previous period of global cooling from about 1940. In addition, the year 1979 also represents the starting date for the satellite-based global temperature estimates (UAH and RSS). For the three surface air temperature estimates shown (HadCRUT, NCDC and GISS) the reference period differs. HadCRUT refers to the official “normal” WMO period 1961-1990, while NCDC and GISS as reference instead uses 1901-2000 and 1951-1980, respectively, which results in higher positive temperature anomalies. For all three surface air temperature records, but especially NCDC and GISS, administrative changes to anomaly values are quite often introduced, even for observations several years back in time. Some changes may be due to the delayed addition of new station data, while others probably have their origin in a change of technique to calculate average values. It is clearly impossible to evaluate the validity of such administrative changes for the outside user of these records. In addition, the three surface records represent a blend of sea surface data collected moving ships or by other means, plus data from land stations of partly unknown quality and unknown degree of representativeness for their region. Many of the land stations have also moved geographically during their existence, and their instrumentation changed. The satellite temperature records also have their problems, but these are generally of a more technical nature and therefore correctable. In addition, the temperature sampling by satellites is more regular and complete on a global basis than that represented by the surface records. It therefore is realistic to recognise that the temperature records are not of equal scientific quality. At the same time the big efforts being put into all five temperature databases should be gratefully acknowledged by all interested in climate science. The differences between the individual diagrams shown below demonstrate the difficulties associated with calculating a correct average global temperature. Essex et al. (2006) have an interesting discussion of the whole concept of calculating an average global temperature. In addition, global surface air temperatures should only be considered a poor indicator of global climate heat changes, as air has relatively little mass associated with it. Ocean heat changes remain the dominant factor for global heat changes. Global air temperatures, however, continues to attract widespread interest, and many scientist assume that the air temperature at least may be considered a useful proxy for the present state of the global climate system. In the temperature diagrams below, the thick line represents the running 37 month average and the thin line the monthly temperature. Both values are the result of a number of mathematical manipulations with the original temperature data, and especially so the running average. In the text below each diagram you will find a link enabling you to download and analyze the data yourself. All diagrams below are using the same temperature scale, to enable easy visual comparison. Global monthly average lower troposphere temperature since 1979 according to University of Alabama at Huntsville (UAH), USA. This graph uses data obtained by the National Oceanographic and Atmospheric Administration (NOAA) TIROS-N satellite, interpreted by Dr. Roy Spencer and Dr. John Christy, both at Global Hydrology and Climate Center, University of Alabama at Huntsville, USA. The thick line is the simple running 37 month average, nearly corresponding to a running 3 yr average. The cooling and warming periods directly influenced by the 1991 Mt. Pinatubo volcanic eruption and the 1998 El Niño, respectively, are clearly visible. Reference period 1981-2010. Last month shown: March 2019. Last diagram update: 7 April 2019. 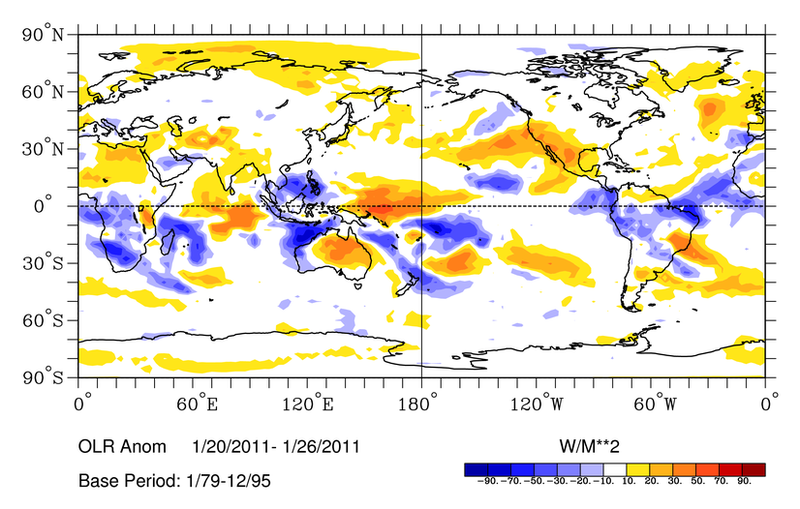 Click here to see the latest UAH MSU global monthly lower troposphere temperature anomaly with comments. Click here to see a maturity diagram for the MSU UAH data series. Click here to read about the latest version (6.0) of the UAH Temperature Dataset (April 28, 2015). Global monthly average lower troposphere temperature since 1979 according to Remote Sensing Systems (RSS). This graph uses data obtained by the National Oceanographic and Atmospheric Administration (NOAA) TIROS-N satellite, and interpreted by Dr. Carl Mears (RSS). The thick line is the simple running 37 month average, nearly corresponding to a running 3 yr average. The cooling and warming periods directly influenced by the 1991 Mt. Pinatubo volcanic eruption and the 1998 El Niño, respectively, are clearly visible. Click here for a description of RSS MSU data products. Last month shown: March 2019. Last diagram update: 7 April 2019. 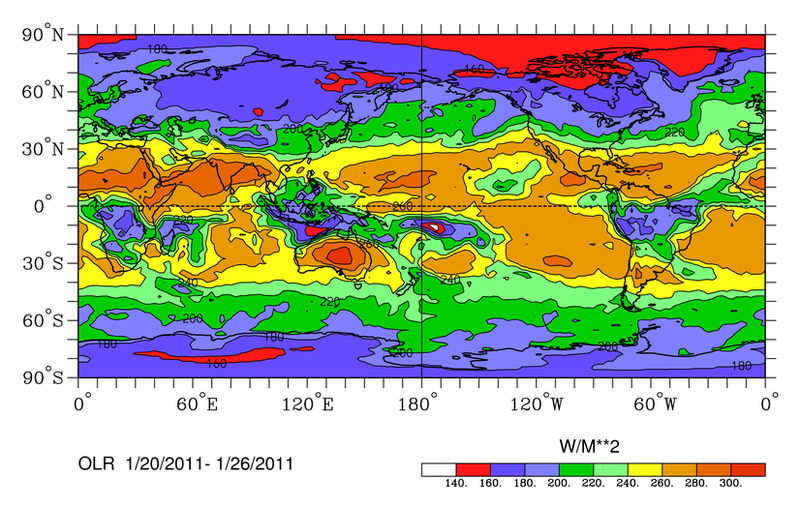 Click here to download the series of RSS MSU global monthly lower troposphere temperature anomalies since January 1979. Click here to see a maturity diagram for the MSU RSS data series. Click here to read a description of the MSU products. NOTE: Since the latest (2015) adjustment of the RSS dataseries, there is a noteworthy difference to the UAH dataseries (compare the two diagrams above). The main reason for the difference appears to be that RSS retain the warming of NOAA-14 relative to NOAA-15, which lifts the RSS series towards higher values. See details of this in Christie et al. 2018: Examination of space-based bulk atmospheric temperatures used in climate research. Global monthly average surface air temperature since 1979 according to Hadley CRUT, a cooperative effort between the Hadley Centre for Climate Prediction and Research and the University of East Anglia's Climatic Research Unit (CRU), UK. The thin line represents the monthly values, while the thick line is the simple running 37 month average, nearly corresponding to a running 3 yr average. An introduction to the dataset has been published by Brohan et al. (2005). Lower down the present page you will find a graph showing the entire series since 1850. Base period: 1961-1990. Last month shown: February 2019. Last diagram update: 30 March 2019. Click here or here to download the series of estimated HadCRUT3 global monthly surface air temperature anomalies since 1850. Click here to see a maturity diagram for the HadCRUT data series. Click here to open a web interface to all the weather station data used by the Hadley Centre, a very useful facility developed by Clive Best, also known for his blog. Please note that the stations are split into 3 groups. 1) those going back to before 1860 2) Those going back to between 1860 and 1930 3) Those with data going back later than 1930. The last option is all stations together - but is very slow to load (>5000 stations). Drag a rectangle to zoom in. Click on a station to see the graph of temperatures and anomalies. October 2, 2014: Please note that HadCRUT4 was released in a new version (HadCRUT.4.3.0.0). The main changes introduced by this new version is a decrease of temperatures 1850-1875 and an increase affecting observations since 2005. For further details of this version change click here. Global monthly average surface air temperature since 1979 according to the National Climatic Data Center (NCDC), USA. This time series is calculated using land surface data from the Global Historical Climatology Network (Version 2) and sea surface temperature anomalies from the United Kingdom MOHSST data set and the NCEP Optimum Interpolated SSTs (Version3; note version change on May 2, 2011). The thick line is the simple running 37 month average, nearly corresponding to a running 3 yr average. Base period: 1901-2000. Last month shown: March 2019. Last diagram update: 18 April 2019. Click here to download the series of the NCDC global monthly surface air temperature anomalies since 1880. Click here to see a maturity diagram for the NCDC data series. June 18, 2015: NCDC has introduced a number of rather large administrative changes to their sea surface temperature record. The overall result is to produce a record giving the impression of a continuous temperature increase, also in the 21st century. As the oceans cover about 71% of the entire surface of planet Earth, the effect of this administrative change is clearly seen in the NCDC record for global surface air temperature above. May 2, 2011: NCDC transitioned to GHCN-M version 3 as the official land component of its global temperature monitoring efforts. GHCN-M version 2 mean temperature dataset will continue to be updated through May 30, 2011, but no support for this version of the dataset will be provided. The global anomalies using GHCN-M version 2 can be accessed here: GHCN-M v2. The net effect of the change from version 2 to 3 can be seen here. Global monthly average surface air temperature since 1979 according to the Goddard Institute for Space Studies (GISS), at Columbia University, New York City, USA. GISS is a laboratory of the Earth-Sun Exploration Division of NASA's Goddard Space Flight Center and a unit of the Columbia University Earth Institute. The thick line is the simple running 37 month average, nearly corresponding to a running 3 yr average. Discussions of reasons why the GISS temperature estimate differs from other estimates can be read by clicking here, here and here. Base period: 1951-1980. Last month shown: March 2019. Last diagram update: 17 April 2019. Click here to download the series of the GISS global monthly surface air temperature anomalies since 1880. Click here to see a maturity diagram for the GISS data series. Click here to download pre-version 3 (v.2) individual GISS station data. It is interesting to compare the various global air temperature estimates as to their internal degree of stability for the whole temperature record as such. Especially for surface air temperature estimates, a certain degree of change over time affecting especially the last few months is to be expected, as additional station data may be reported and incorporated in the database. But for the older part of the temperature record numerical stability over time would be expected, provided that the mathematical procedure used for estimating the global temperature is considered mature by the research team preparing the data series considered. In this context, maturity would imply that, for example, the November 1985 temperature reported by a certain database in February 2009 would be identical to the November 1985 value reported previously by the same database. Below a series of diagrams is shown to illustrate the degree of maturity, calculated for various databases by plotting the net change in their global temperature record since May 2008 (or February 2009). May 2008 (or February 2008) has been chosen as start date for this test as this represents the oldest version of the individual temperature records available to the webmaster. All diagrams below are using the same temperature scale, to enable easy visual comparison. A fine study of temporal instability can be inspected here (in Norwegian). Maturity diagram showing net change since 8 May 2008 in the global monthly lower troposphere temperature record prepared by the University of Alabama at Huntsville, USA. This temperature estimate extends back to December 1978. Click here to see a graph showing the most recent version of the UAH MSU global temperature estimate. Click here to download the entire series of UAH MSU global monthly lower troposphere temperatures since December 1978. Click here for explanation of temporal stability. Last diagram update: 7 April 2019. Click here to download the most recent version of UAH MSU global monthly lower troposphere temperature anomalies since December 1978. Click here to read about UAH version 6.0 change April 2012. Maturity diagram showing net change since 8 May 2008 in the global monthly lower troposphere temperature record prepared by the Remote Sensing Systems (RSS). This temperature estimate extends back to January 1979. Click here to see a graph showing the most recent version of the RSS MSU global temperature estimate. Please note that RSS January 2011 changed from Version 3.2 to Version 3.3 of their MSU/AMSU lower tropospheric (TLT) temperature product. Click here to read a description of the change from version 3.2 to 3.3, and previous changes. Click here to download the entire series of RSS MSU global monthly lower troposphere temperatures since January 1979. Click here for explanation of temporal stability. Last diagram update: 7 April 2019. Click here to download the most recent version of RSS MSU global monthly lower troposphere temperature anomalies since January 1979. Click here to download the May 2008 version of RSS MSU global monthly lower troposphere temperature anomalies since January 1979. Maturity diagram showing net change since 25 February 2008 in the global monthly surface air temperature record prepared by the Hadley Centre for Climate Prediction and Research and the University of East Anglia's Climatic Research Unit (CRU), UK. This temperature estimate extends back to January 1850. Click here to see a graph showing the most recent version of the HadCRUT3 and 4 global temperature estimate. Previous to the version change 3 to 4 (October 2012), the HadCRUT temperature record showed a high degree of temporal stability. The diagram below shows a comparison between the two versions of HadCRUT (stand October 2012). Another version change was made on October 2, 2014. Click here for an explanation of temporal stability. Last diagram update: 30 March 2019. Click here to download the February 2008 version of estimated HadCRUT3 global monthly surface air temperature anomalies since 1850. It is interesting to note that the overall net adjustment shown by the HadCRUT surface temperature record since February 2008 (see figure above) is that of more or less equal warming for the entire record since 1850. This is in contrast to the net adjustment of the two other surface records, NCDC and GISS, which both display a net cooling adjustment before 1950-60, and a net warming adjustment for the more recent part of the record, resulting in an overall increasing temperature increase since 1880. Maturity diagram showing net change since 17 May 2008 in the global monthly surface air temperature record prepared by the National Climatic Data Center (NCDC), USA. The net result of the adjustments made are becoming substantial, and adjustments since May 2006 occasionally exceeds 0.1oC. Before 1945 global temperatures are generally changed toward lower values, and toward higher values after 1945, resulting in a more pronounced 20th century warming (about 0.15oC) compared to the NCDC temperature record published in May 2008. Arrows indicate two months where the adjustments over time are illustrated in the figure below. Last diagram update: 18 April 2019. Click here to download the most recent version of the NCDC global monthly surface air temperature anomalies since 1880. Click here to download the May 2008 version of the NCDC global monthly surface air temperature anomalies since 1880. Click here for a summary of the July 2009 (Smith et al. 2008) methodological changes in the land-ocean NCDC temperature analyses. Click here for information about the November 2011 version change (GHCN-M version 3.1.0 replaced GHCN-M version 3). Click here and here for information about the September 2012 version change (GHCN-M version 3.2.0 replaced GHCN-M version 3.1.0). Click here for an explanation of temporal stability. The two arrows in the diagram above indicate two months for which the adjustments over time is shown below. On May 2, 2011, NCDC transitioned to GHCN-M version 3 as the official land component of its global temperature monitoring efforts. GHCN-M version 2 mean temperature dataset will continue to be updated through May 30, 2011, but no further support for this version of the dataset will be provided. In November 2011, the GHCN-M version 3.1.0 replaced the GHCN-M version 3. For more information about the GHCN-M version 3.1.0. The overall net effect of the transition from GHCN-M version 2 to version 3 is to increase global temperatures before 1900, to decrease them between 1900 and 1950, and to increase temperatures after 1950. The diagram below exemplify adjustments made by NCDC since May 2008 for two months (see arrows in diagram above); January 1915 and January 2000. Diagram showing the adjustment made since May 2008 by the National Climatic Data Center (NCDC) in the anomaly values for the two months January 1915 and January 2000. See also this diagram. Last diagram update 18 April 2019. Maturity diagram showing net change since 17 May 2008 in the global monthly surface air temperature record prepared by the Goddard Institute for Space Studies (GISS), at Columbia University, New York City, USA. This temperature estimate extends back to January 1880. Click here to see a graph showing the most recent version of the GISS global temperature estimate. The net effects of the adjustments made since May 2008 are to generate a more smoothly increasing global temperature since 1880. Discussions on the background for the lack of temporal stability for the GISS temperature record can be read here, here and here. Arrows indicate two months where the adjustments over time are illustrated in the figure below. Last diagram update 17 April 2019. Click here to download the most recent version of the GISS global monthly surface air temperature anomalies since 1880. Click here to download the May 2008 version of the GISS global monthly surface air temperature anomalies since 1880. Click here to see a fine study of GISS temporal instability (in Norwegian). Click here for explanation of temporal stability. Diagram showing the adjustment made since May 2008 by the Goddard Institute for Space Studies (GISS) in anomaly values for the months January 1910 and January 2000. See also this diagram. Last diagram update 17 April 2019. Unless there is an error in the GISS temperature anomaly values downloaded on 15 September 2012 (or 15 August 2012), a major change appears to have taken place since 15 August 2012. The GISS maturity diagram below show the status per 15 August 2012, and should be compared with the diagram above from 15 September 2012. Apparently the change may reflect the September 2012 NCDC change from GHCN-M version 3.1.0 to GHCN-M version 3.2.0. Click here and here for more information on this. GISS Maturity diagram per 15 August 2012. Compare with the diagram per 15 September 2012. Based on the above it is not possible to conclude which of the above five databases represents the best estimate on global temperature variations. The answer to this question remains elusive. All five databases are the result of much painstaking work, and they all represent admirable attempts towards establishing an estimate of recent global temperature changes. At the same time it should however be noted, that a temperature record which keeps on changing the past hardly can qualify as being correct. With this in mind, it is interesting that none of the global temperature records shown above are characterised by high temporal stability. Presumably this illustrates how difficult it is to calculate a meaningful global average temperature. A re-read of Essex et al. 2006 might be worthwhile. In addition to this, surface air temperature remains a poor indicator of global climate heat changes, as air has relatively little mass associated with it. Ocean heat changes are the dominant factor for global heat changes. In order to enable a visual comparison of the five different global temperature estimates shown above, the diagrams below show some or all series superimposed. As the base period differs for the different temperature estimates (see above), they are not directly comparable. All data series were therefore normalised by setting the average value of the initial 30 years from January 1979 to December 2008 equal to zero, before inclusion in the diagram below. In addition to the visual analysis below, the reader might also find it useful to inspect the maturity analysis presented above. Superimposed plot of Quality Class 1 global monthly temperature estimates. As the base period differs for the different temperature estimates, they have all been normalised by comparing to the average value of 30 years from January 1979 to December 2008. The heavy black line represents the simple running 37 month (c. 3 year) mean of the average of both temperature records. The numbers shown in the lower right corner represent the temperature anomaly relative to the above average. Values are rounded off to the nearest two decimals, even though some of the original data series come with more than two decimals. Last month shown: February 2019. Last diagram update: 31 March 2019. Superimposed plot of Quality Class 1 and Quality Class 2 global monthly temperature estimates. As the base period differs for the different temperature estimates, they have all been normalised by comparing to the average value of 30 years from January 1979 to December 2008. The heavy black line represents the simple running 37 month (c. 3 year) mean of the average of all three temperature records. The numbers shown in the lower right corner represent the temperature anomaly relative to the above average. Values are rounded off to the nearest two decimals, even though some of the original data series come with more than two decimals. Last month shown: February 2019. Last diagram update: 31 March 2019. Superimposed plot of Quality Class 1 and Quality Class 2 and Quality Class 3 global monthly temperature estimates. As the base period differs for the different temperature estimates, they have all been normalised by comparing to the average value of 30 years from January 1979 to December 2008. The heavy black line represents the simple running 37 month (c. 3 year) mean of the average of all five temperature records. The numbers shown in the lower right corner represent the temperature anomaly relative to the above average. Values are rounded off to the nearest two decimals, even though some of the original data series come with more than two decimals. Last month shown: February 2019. Last diagram update: 31 March 2019. It should be kept in mind that satellite- and surface-based temperature estimates are derived from different types of measurements, and that comparing them directly as done in the diagram above therefore in principle is problematical. For that reason, in the analysis below these two different types of global temperature estimates are compared to each other. However, as both types of estimate often are discussed together, the above diagram may nevertheless be of interest. In fact, the different types of temperature estimates appear to agree quite well as to the overall temperature variations on a 2-3 year scale, although on a short term scale there may be considerable differences. However, as shown in the paragraph below, surface temperature records seems to be drifting towards higher temperature anomalies than the satellite records. Diagram showing the average global temperature change (anomaly) during the satellite observational period (since January 1979), according to five global temperature estimates shown above. The upper panel show the average anomalies for the last 12 months, the mid panel show the average anomalies for the last 5 years, while the lower panel show the average anomalies for the last 10 years. As the base period differs for the different temperature estimates, they have all been normalised by comparing to the average value of 30 years from January 1979 to December 2008. Last month included in analysis: February 2019. Last diagram update: 31 March 2019. Usually modern surface air temperatures are compared to the so-called normal temperature, representing the so-called normal climate. This 'normal' temperature is calculated as the average for values recorded during a 30-year period. The period 1961-1990 is the official World Meteorological Organisation (WMO) normal period, and is therefore often the time period referred to. Another 30-year period used as reference for comparisons is 1951-1980. This is partly because the total number of meteorological stations during this period reached a maximum, and since has undergone a marked reduction in number. Unfortunately, both these periods are dominated by the cold period 1945-1980, and almost any comparison with such a low average value will therefore appear as high or warm. This makes it difficult to decide if surface air temperatures at present are increasing or decreasing? The only thing that will be clear is that modern temperatures are higher than back in this cold period. Click here to see a diagram showing the entire global temperature series (HadCRUT4) since 1850 with the 1945-1980 cold period and the WMO normal period indicated on the time line. Plot showing the average of monthly global surface air temperature estimates (HadCRUT4, GISS and NCDC) and satellite-based temperature estimates (RSS MSU and UAH MSU). The thin lines indicate the monthly value, while the thick lines represent the simple running 37 month average, nearly corresponding to a running 3 yr average. The lower panel shows the monthly difference between surface air temperature and satelitte temperatures. As the base period differs for the different temperature estimates, they have all been normalised by comparing to the average value of 30 years from January 1979 to December 2008. Last month included in analysis: February 2019. Last diagram update: 31 March 2019. As is shown by the diagram above, the average of surface based temperature estimates is not identical to that obtained by satellites. In general, however, the visual agreement is quite good on a time scale of few months. However, since about 2003, the average global surface air temperature is drifting away in positive direction from the average satellite temperature, meaning that the surface records show warming in relation to the troposphere records. The reasons for this is not clear, but is probably at least partly a result of the recurrent administrative changes of the surface records, see here, here and here. Global monthly average surface air temperature (HadCRUT4, NCDC, GISS) minus global monthly average lower troposphere temperature (UAH MSU, RSS MSU) since 1979. The thin blue line shows the monthly temperature difference between anomalies calculated for surface and lower troposphere observations, respectively. The thick blue line is the simple running 37 month average, nearly corresponding to a running 3 yr average. The dotted red line is the linear fit line, statistics of which is presented in the lower right corner of the diagram. As the five data series are using different reference (normal) periods, they have all been normalised by comparing to the average value of 30 years from January 1979 to December 2008. Last month included in analysis: February 2019. Last diagram update: 31 March 2019. Click here to see the HadCRUT4 temperature anomaly diagram since 1979. Click here to see the NCDC temperature anomaly diagram since 1979. Click here to see the GISS temperature anomaly diagram since 1979. Click here to see the UAH MSU temperature anomaly diagram since 1979. Click here to see the RSS MSU temperature anomaly diagram since 1979. According to the above temperature records, the surface air temperature have been rising more rapid than the temperature in the lower troposphere since January 1979, about 0.1oC. Diagram showing the latest 5, 10, 20 and 30 yr linear annual global temperature trend, calculated as the slope of the linear regression line through the data points, for two satellite-based temperature estimates (UAH MSU and RSS MSU), the Quality Class 1 series. Last month included in analysis: February 2019. Last diagram update: 31 March 2019. Diagram showing the latest 5, 10, 20, 30, 50, 70 and 100 yr linear annual global temperature trend, calculated as the slope of the linear regression line through the data points, for three surface-based temperature estimates (HadCRUT4 and GISS + NCDC), the Quality Class 2 and 3 series, respectively. Last month included in analysis: February 2019. Last diagram update: 31 March 2019. The two diagrams above show the calculated linear annual global temperature trend (calculated as the slope of the linear regression line through the data points) for the last 5, 10, 20, 30, 50, 70 or 100 yr period. The difference between satellite- and surface-based temperatures is clear. Linear trends depend on the length of the time period considered. The shorter the period considered, the more variable the calculated trend will be as new monthly data are added to the data series. In addition, linear trends calculated for short periods often have higher numerical values than trends calculated for longer periods. When comparing linear temperature trends, is is therefore important always to use time periods of similar length. As an visual example of this effect, the diagrams below show trends calculated for the last 20, 15, 10 and 5 years, using the combined Quality Class 1 series. Linear trend analyses represent a relatively crude way of numerical analysis, and often a better approximation to the original data may be obtained by using other data models, e.g., polynomial, as shown in the diagrams below. The R2 value may be considered an indicator of the degree of success of the data model adopted, but the number of data must also be considered. It should also be emphasized, that linear trend analyses are sensitive to values near the ends points of the data series considered, and especially for short series. Finally, any trend calculated only informs about past behaviour, and not about the future. Before attempting any linear trend (or any other) analysis of time series, a proper statistical model should be chooosen, based on statistical justification. For temperature time series there is no a priori physical reason why the long-term trend should be linear in time. In fact, climatic time series often have trends for which a straight line is not a good approximation, as is clearly seen from several of the diagrams above and below. For a clear description of the problem encountered by many temperature time series analyses, please see Keenan, D.J. 2014: Statistical Analyses of Surface Temperatures in the IPCC Fifth Assessment Report. Last 20 years global monthly average surface air temperature according to the two satellite-based temperature estimates (UAH MSU and RSS MSU), Quality Class 1. The thin blue line represents the monthly values. The thick black line is the linear fit, with 95% confidence intervals indicated by the two thin black lines. The thick green line represents a 5-degree polynomial fit, with 95% confidence intervals indicated by the two thin green lines. A few key statistics is given in the lower part of the diagram (note that the linear trend is the monthly trend). Last month included in analysis: March 2019. Last diagram update: 7 April 2019. Fits (linear as well as polynomial) only attempt to describe the past, and have little or no predictive power. Last 15 years global monthly average surface air temperature according to the two satellite-based temperature estimates (UAH MSU and RSS MSU), Quality Class 1. The thin blue line represents the monthly values. The thick black line is the linear fit, with 95% confidence intervals indicated by the two thin black lines. The thick green line represents a 5-degree polynomial fit, with 95% confidence intervals indicated by the two thin green lines. A few key statistics is given in the lower part of the diagram (note that the linear trend is the monthly trend). Last month included in analysis: March 2019. Last diagram update: 7 April 2019. Last 10 years global monthly average surface air temperature according to the two satellite-based temperature estimates (UAH MSU and RSS MSU), Quality Class 1. The thin blue line represents the monthly values. The thick black line is the linear fit, with 95% confidence intervals indicated by the two thin black lines. The thick green line represents a 5-degree polynomial fit, with 95% confidence intervals indicated by the two thin green lines. A few key statistics is given in the lower part of the diagram (note that the linear trend is the monthly trend). Last month included in analysis: March 2019. Last diagram update: 7 April 2019. Last 5 years global monthly average surface air temperature according to the two satellite-based temperature estimates (UAH MSU and RSS MSU), Quality Class 1. The thin blue line represents the monthly values. The thick black line is the linear fit, with 95% confidence intervals indicated by the two thin black lines. The thick green line represents a 5-degree polynomial fit, with 95% confidence intervals indicated by the two thin green lines. A few key statistics is given in the lower part of the diagram (note that the linear trend is the monthly trend). Last month included in analysis: March 2019. Last diagram update: 7 April 2019. Running 50 year linear annual temperature trend calculated from monthly global average surface air temperature anomaly provided by to Hadley CRUT, a cooperative effort between the Hadley Centre for Climate Prediction and Research and the University of East Anglia's Climatic Research Unit (CRU), UK. The blue line represents the 50x12 month linear trend, plotted at the last month included in the analysis. As the HadCRUT3 record begins in January 1850, the first 50 yr plot is for December 1899. Last month included in analysis: February 2019. Last diagram update: 30 March 2019. The variation shown by the moving 50 yr linear global temperature trend suggests the existence of an 60-65 yr long periodic natural temperature variation. The diagram was kindly suggested by a visitor to this web site. Click here and here to see two other examples of apparent cyclic natural climate variations, relating to sea surface temperature and atmospheric pressure, respectively . The Central England surface air temperature series is the longest existing meteorological record. Thin lines = annual values. Thick lines = running 11 yr average. The above graphs for annual, summer and winter temperatures have been prepared using the composite monthly meteorological series originally painstakingly homogenized and published by the late professor Gordon Manley (1974). The data series is now updated by the Hadley Centre. Last diagram update: 9 March 2017. Click here to see a larger version of the above diagram. Click here for the Met Office UK year to date plot. Click here to see several data download options. Global monthly average lower troposphere temperature since 1979 for the tropics and the northern and southern extratropics, according to University of Alabama at Huntsville, USA. This graph uses data obtained by the National Oceanographic and Atmospheric Administration (NOAA) TIROS-N satellite, interpreted by Dr. Roy Spencer and Dr. John Christy, both at Global Hydrology and Climate Center, University of Alabama at Huntsville, USA. Thick lines are the simple running 37 month average, nearly corresponding to a running 3 yr average. The cooling and warming periods directly influenced by the 1991 Mt. Pinatubo volcanic eruption and the 1998 El Niño, respectively, are clearly visible, especially in the tropics and the northern extratropics. Reference period 1981-2010. Last month shown: March 2019. Last diagram update: 7 April 2019. Global monthly average lower troposphere temperature since 1979 for the tropics and the northern and southern extratropics, according to Remote Sensing Systems (RSS). These graphs uses data obtained by the National Oceanographic and Atmospheric Administration (NOAA) TIROS-N satellite, and interpreted by Dr. Carl Mears (RSS). Thick lines are the simple running 37 month average, nearly corresponding to a running 3 yr average. Click here for a description of RSS MSU data products. Please note that RSS January 2011 changed from Version 3.2 to Version 3.3 of their MSU/AMSU lower tropospheric (TLT) temperature product. Click here to read a description of the change from version 3.2 to 3.3, and previous changes. Last month shown: March 2019. Last diagram update: 7 April 2019. Global monthly average lower troposphere temperature since 1979 for the North Pole and South Pole regions, according to University of Alabama at Huntsville, USA. This graph uses data obtained by the National Oceanographic and Atmospheric Administration (NOAA) TIROS-N satellite, interpreted by Dr. Roy Spencer and Dr. John Christy, both at Global Hydrology and Climate Center, University of Alabama at Huntsville, USA. Thick lines are the simple running 37 month average, nearly corresponding to a running 3 yr average. Reference period 1981-2010. Last month shown: March 2019. Last diagram update: 7 April 2019. Global monthly average lower troposphere temperature since 1979 measured over land and oceans, respectively, according to University of Alabama at Huntsville, USA. This diagram uses data obtained by the National Oceanographic and Atmospheric Administration (NOAA) TIROS-N satellite, interpreted by Dr. Roy Spencer and Dr. John Christy, both at Global Hydrology and Climate Center, University of Alabama at Huntsville, USA. Thick lines are the simple running 37 month average, nearly corresponding to a running 3 yr average. Reference period 1981-2010. Last month shown: March 2019. Last diagram update: 7 April 2019. Northern hemisphere monthly average lower troposphere temperature since 1979 measured over land and oceans, respectively, according to University of Alabama at Huntsville, USA. This diagram uses data obtained by the National Oceanographic and Atmospheric Administration (NOAA) TIROS-N satellite, interpreted by Dr. Roy Spencer and Dr. John Christy, both at Global Hydrology and Climate Center, University of Alabama at Huntsville, USA. Thick lines are the simple running 37 month average, nearly corresponding to a running 3 yr average. Reference period 1981-2010. Last month shown: March 2019. Last diagram update: 7 April 2019. Southern hemisphere monthly average lower troposphere temperature since 1979 measured over land and oceans, respectively, according to University of Alabama at Huntsville, USA. This diagram uses data obtained by the National Oceanographic and Atmospheric Administration (NOAA) TIROS-N satellite, interpreted by Dr. Roy Spencer and Dr. John Christy, both at Global Hydrology and Climate Center, University of Alabama at Huntsville, USA. Thick lines are the simple running 37 month average, nearly corresponding to a running 3 yr average. Reference period 1981-2010. Last month shown: March 2019. Last diagram update: 7 April 2019. Tropics-Polar monthly anomaly difference from average lower troposphere temperatures since 1979, according to University of Alabama at Huntsville, USA. This diagram uses data obtained by the National Oceanographic and Atmospheric Administration (NOAA) TIROS-N satellite, interpreted by Dr. Roy Spencer and Dr. John Christy, both at Global Hydrology and Climate Center, University of Alabama at Huntsville, USA. Thick lines are the simple running 37 month average, nearly corresponding to a running 3 yr average. Reference period 1981-2010. Last month shown: March 2019. Last diagram update: 7 April 2019. The diagram table below contains clickable monthly spatial temperature diagrams since 2005, to illustrate the changeable geographical pattern of surface air temperature variations, integrated by graphs like that above. These diagrams are geographical asymmetrical to cover most of the planets land areas, ranging from 72oN to 60oS. Spatial distribution of monthly surface air temperature deviation between 72oN and 60oS in relation to the average for the period 1998-2006. Warm colours indicates areas with higher temperature than the 1998-2006 average, while blue colours indicate lower than average temperatures. Starting from 2015, the past 10 years are used as reference level. In the individual diagrams the month is indicated by a number: 1 = January, 2 = February, etc. Click on the individual small diagrams to open full-size diagrams. Please also read the notes below before interpreting the diagrams. Similar spatial temperature diagrams showing the polar regions can be seen by clicking here. Data source: NASA Goddard Institute for Space Studies (GISS). Last diagram update 17 April 2019. It is important to note that the map projection used above is of the type Mercator. This is a useful cylindrical map projection that preserves angles at all locations, but scale varies from place to place, distorting the size of land areas. In particular, areas closer to the poles are more affected, making land areas of similar size looking increasingly oversized towards the poles. To exemplify this effect, the areas of Mexico (1,972,550 km2) and Greenland (2,166,086 km2) are comparable in size. Greenland, however, in the map looks very much bigger than Mexico, even though only the southern half of Greenland is shown. The visual effect of this popular map type is to overstate the importance of temperature variations near the poles, compared to equatorial regions. To avoid the worst effects of this cartographic distortion of areas, the two Polar Regions are therefore shown in separate, polar projections. Click here to go to the polar spatial temperature diagrams. To monitor the present global temperature trend, up or down, it is not efficient to compare with some past period like, e.g., 1961-1990, even though this is what is frequently done. This will not inform about the current temperature trend. It seems to make more sense to compare with a more recent period. This is why the diagrams in the table above all use 1998-2006 as reference period. In addition, by using this recent reference period, is will gradually be possible to visualize if 1998-2006 represents a peak period for the global average temperature, or if modern temperatures are increasing to a even higher level. It should therefore be carried in mind that such a visual comparison does not represent a statistical test, but only a way of obtaining an visual overview of temperature patterns within the month considered. Positive or negative temperature deviations represent the result of monthly weather variations, and any clear pattern of overall climatic warming or cooling will take several years to be identified in a statistical sense. All the diagrams in the table above were prepared using gridded data downloaded from the public domain NASA Goddard Institute for Space Studies (GISS) web page. For surface interpolation of the gridded data a kriging algorithm was used, plotting all data in a polar projection map. The kriging procedure attempts to express trends and is widely considered one of the more flexible interpolation methods, producing a smooth map with few ‘bull eyes’. It is usually recommended for gridding almost any type of data set, especially data sets with a heterogeneous point distribution, such as characterising the present data set. It should be noted that the observation network within the two regions considered is not of equal density or quality all over the geographical regions covered by the diagrams. Anomalies of global annual surface air temperature (MAAT) since 1850 according to Hadley CRUT, a cooperative effort between the Hadley Centre for Climate Prediction and Research and the University of East Anglia's Climatic Research Unit (CRU), UK. The average for 1979-2008 (30 yrs) has been set to zero, to make comparison with other temperature data series (above and below) easy. Last year shown: 2018. Last figure update: 19 February 2019. Anomalies of global annual surface air temperature (MAAT) since 1880 according to the National Climatic Data Center (NCDC), USA. This time series is calculated using land surface data from the Global Historical Climatology Network (Version 2) and sea surface temperature anomalies from the United Kingdom MOHSST data set and the NCEP Optimum Interpolated SSTs (Version2). The average for 1979-2008 (30 yrs) has been set to zero, to make comparison with other temperature data series (above and below) easy. Last year shown: 2018. Last figure update: 19 February 2019. Anomalies of global annual surface air temperature (MAAT) since 1880 according to the Goddard Institute for Space Studies (GISS), at Columbia University, New York City, USA. GISS is a laboratory of the Earth-Sun Exploration Division of NASA's Goddard Space Flight Center and a unit of the Columbia University Earth Institute. The average for 1979-2008 (30 yrs) has been set to zero, to make comparison with other temperature data series (above and below) easy. Last year shown: 2018. Last figure update: 19 February 2019. Click here to download the entire series of the GISS global monthly surface air temperatures since 1880. Anomalies of global annual surface air temperature (MAAT) since 1979 according to the University of Alabama at Huntsville, USA. This graph uses data obtained by the National Oceanographic and Atmospheric Administration (NOAA) TIROS-N satellite, interpreted by Dr. Roy Spencer and Dr. John Christy, both at Global Hydrology and Climate Center, University of Alabama at Huntsville, USA. The average for 1979-2008 (30 yrs) has been set to zero, to make comparison with other temperature data series (above and below) easy. Last year shown: 2018. Last figure update: 19 February 2019. Anomalies of global annual surface air temperature (MAAT) since 1979 according to the Remote Sensing Systems (RSS). This graph uses data obtained by the National Oceanographic and Atmospheric Administration (NOAA) TIROS-N satellite, and interpreted by Dr. Carl Mears (RSS). The average for 1979-2008 (30 yrs) has been set to zero, to make comparison with other temperature data series (above and below) easy. Last year shown: 2018. Last figure update: 19 February 2019. Anomalies of Northern Hemisphere annual surface air temperature (MAAT) since 1850 according to Hadley CRUT, a cooperative effort between the Hadley Centre for Climate Prediction and Research and the University of East Anglia's Climatic Research Unit (CRU), UK. The average for 1979-2008 (30 yrs) has been set to zero, to make comparison with other temperature data series (above and below) easy. Last year shown: 2018. Last figure update: 19 February 2019. Anomalies of Northern Hemisphere annual surface air temperature (MAAT) since 1880 according to the National Climatic Data Center (NCDC), USA. This time series is calculated using land surface data from the Global Historical Climatology Network (Version 2) and sea surface temperature anomalies from the United Kingdom MOHSST data set and the NCEP Optimum Interpolated SSTs (Version2). The average for 1979-2008 (30 yrs) has been set to zero, to make comparison with other temperature data series (above and below) easy. Last year shown: 2018. Last figure update: 19 February 2019. Please note that the early part of the NCDC record has now been changed so much towards lower values than just a few years ago, that the graph now extents below the x-axis. Click here for further details on temporal instability of the NCDC temperature record. Anomalies of Northern Hemisphere annual surface air temperature (MAAT) since 1880 according to the Goddard Institute for Space Studies (GISS), at Columbia University, New York City, USA. GISS is a laboratory of the Earth-Sun Exploration Division of NASA's Goddard Space Flight Center and a unit of the Columbia University Earth Institute. The average for 1979-2008 (30 yrs) has been set to zero, to make comparison with other temperature data series (above and below) easy. Last year shown: 2018. Last figure update: 19 February 2019. Anomalies of Northern Hemisphere annual surface air temperature (MAAT) since 1979 according to the University of Alabama at Huntsville, USA. This graph uses data obtained by the National Oceanographic and Atmospheric Administration (NOAA) TIROS-N satellite, interpreted by Dr. Roy Spencer and Dr. John Christy, both at Global Hydrology and Climate Center, University of Alabama at Huntsville, USA. The average for 1979-2008 (30 yrs) has been set to zero, to make comparison with other temperature data series (above and below) easy. Last year shown: 2018. Last figure update: 19 February 2019. Anomalies of Northern Hemisphere annual surface air temperature (MAAT) since 1979 according to the Remote Sensing Systems (RSS). This graph uses data obtained by the National Oceanographic and Atmospheric Administration (NOAA) TIROS-N satellite, and interpreted by Dr. Carl Mears (RSS). The average for 1979-2008 (30 yrs) has been set to zero, to make comparison with other temperature data series (above and below) easy. Last year shown: 2018. Last figure update: 19 February 2019. Anomalies of Southern Hemisphere annual surface air temperature (MAAT) since 1850 according to Hadley CRUT, a cooperative effort between the Hadley Centre for Climate Prediction and Research and the University of East Anglia's Climatic Research Unit (CRU), UK. The average for 1979-2008 (30 yrs) has been set to zero, to make comparison with other temperature data series (above and below) easy. Last year shown: 2018. Last figure update: 19 February 2019. Anomalies of Southern Hemisphere annual surface air temperature (MAAT) since 1880 according to the National Climatic Data Center (NCDC), USA. This time series is calculated using land surface data from the Global Historical Climatology Network (Version 2) and sea surface temperature anomalies from the United Kingdom MOHSST data set and the NCEP Optimum Interpolated SSTs (Version2). The average for 1979-2008 (30 yrs) has been set to zero, to make comparison with other temperature data series (above and below) easy. Last year shown: 2018. Last figure update: 19 February 2019. Anomalies of Southern Hemisphere annual surface air temperature (MAAT) since 1880 according to the Goddard Institute for Space Studies (GISS), at Columbia University, New York City, USA. GISS is a laboratory of the Earth-Sun Exploration Division of NASA's Goddard Space Flight Center and a unit of the Columbia University Earth Institute. The average for 1979-2008 (30 yrs) has been set to zero, to make comparison with other temperature data series (above and below) easy. Last year shown: 2018. Last figure update: 19 February 2019. Anomalies of Southern Hemisphere annual surface air temperature (MAAT) since 1979 according to the University of Alabama at Huntsville, USA. This graph uses data obtained by the National Oceanographic and Atmospheric Administration (NOAA) TIROS-N satellite, interpreted by Dr. Roy Spencer and Dr. John Christy, both at Global Hydrology and Climate Center, University of Alabama at Huntsville, USA. The average for 1979-2008 (30 yrs) has been set to zero, to make comparison with other temperature data series (above and below) easy. Last year shown: 2018. Last figure update: 19 February 2019. Anomalies of Southern Hemisphere annual surface air temperature (MAAT) since 1979 according to the Remote Sensing Systems (RSS). This graph uses data obtained by the National Oceanographic and Atmospheric Administration (NOAA) TIROS-N satellite, and interpreted by Dr. Carl Mears (RSS). The average for 1979-2008 (30 yrs) has been set to zero, to make comparison with other temperature data series (above and below) easy. Last year shown: 2018. Last figure update: 19 February 2019. Global monthly average temperature in different altitudes according to University of Alabama at Huntsville (UAH). The thin lines represent the monthly average, and the thick line the simple running 37 month average, nearly corresponding to a running 3 yr average. Last month shown: March 2019. Last diagram update: 7 April 2019. Click here, here, here and here to download the series of UAH MSU global monthly atmosphere temperature anomalies since December 1978. Global monthly average temperature in different altitudes according to Remote Sensing Systems (RSS). The thin lines represent the monthly average, and the thick line the simple running 37 month average, nearly corresponding to a running 3 yr average. Last month shown: March 2019. Last diagram update: 7 April 2019. Click here to download the series of RSS MSU global monthly atmosphere temperature anomalies since January 1979. Seasonal global upper air temperature anomalies at 850-300 mb according to RATPAC-A Version 2. The thin lines represent the seasonal (3-month) average, and the thick line the simple running 13-season average, nearly corresponding to a running 3 yr average. Last season shown: July-September 2018. Last diagram update: 28 October 2018. Click here to download the series of RATPAC-A version 2 seasonal global upper air temperature anomalies since January 1958. Seasonal global upper air temperature anomalies at 300-100 mb according to RATPAC-A Version 2. The thin lines represent the seasonal (3-month) average, and the thick line the simple running 13-season average, nearly corresponding to a running 3 yr average. Last season shown: July-September 2018. Last diagram update: 28 October 2018. Seasonal global upper air temperature anomalies at 100-50 mb according to RATPAC-A Version 2. The thin lines represent the seasonal (3-month) average, and the thick line the simple running 13-season average, nearly corresponding to a running 3 yr average. Last season shown: July-September 2018. Last diagram update: 28 October 2018. Modelled zonally averaged, equilibrated temperature change with altitude associated with doubling atmospheric CO2 (Lee et al. 2007). Units for modelled temperature change are given in degrees Celcius. The horizontal axis begins at 90oN to the left, and ends at 90oS to the right. The vertical axis begins at the planet surface and extends to 10 hPA (ca. 16 km height). For the 200, 300 and 1000 hPa levels (ca. 12, 9 and 0 km altitude, respectively) the observed temperature change since 1979 is shown in the diagrams below. Lindzen (1999 and 2007) argued that the surface temperature anomalies are not the best way of identifying the effect of an atmospheric CO2 increase. He stressed that the radiation in the energy flux balance relations can be thought of as coming mainly from the atmospheric layer where the infrared optical depth is near 1. This characteristic emission layer is high above the surface and is typically located at an altitude somewhat below the tropopause. The height of the tropopause varies with latitude. In the tropics, the tropopause height is about 16-17 km, near 30° latitude about 12 km, and near the poles the tropopause height is around 8 km above the surface. The diagrams above shows how temperature changes when CO2 is doubled in 4 different General Circulation Models (Lee et al. 2007). These model runs differ from those that were run for the IPCC in that the models were simplified to isolate the effects of CO2 forcing and climate feedbacks (Lindzen 2007). Also the models were run until equilibrium was established rather than run in a transient mode in order to simulate the past. Thus, they tend to isolate greenhouse warming from other things that might be going on. The model runs shown in the above diagrams all suggest warming due to CO2 doubling to peak not at the surface in the tropics, but in the troposphere near the 200-300 hPa level, roughly corresponding to 12-9 km altitude. The main reason for the inter-model variation is that the amount of water vapour differs among the models. The expected warming above the tropics is 2-3 times larger than near the surface, regardless of the sensitivity of the particular model. This is, in fact, the very signature of greenhouse warming (cf. Lindzen 2007). In the diagrams below the temperature change at and above Equator is shown, using the Hadley Centre's radiosonde temperature product HadAT (200 and 300 hPa), and HadCRUT3 meteorological surface data. HadAT consists of temperature anomaly time series on 9 standard reporting pressure levels (850hPa to 30hPa), and is derived from 676 individual radiosonde stations with long-term records. Data uncertainties and limitations are described here. The latitudinal band used in the diagrams below is from 20oN to 20oS. To enable easy comparison with the global temperature changes shown higher up this page, 1979 has been chosen as start year. The full HadAT data series, however, goes back to 1958. Please note that the temperature scale in these diagrams are different from the scale used above, to accommodate the larger temperature variations at height. All data series were normalised by setting their starting value in January 1979 = 0, before inclusion in the diagrams below. Temperature change at 200hPa (c. 12 km height) between 20oN and 20oS since 1979, according to HadAT. The thin blue line shows the monthly values, while the thick blue line represents the simple running 37 month average, nearly corresponding to a running 3 yr average. The stippled red line shows the linear fit for the period shown, with basic statistics shown in the upper left corner of the diagram. The data were normalised by setting the average of their initial 120 months (10 years) from January 1979 to December 1988 = 0. Last month shown: December 2012. Last diagram update: 4 May 2013. Click here to download the entire HadAT series since 1958. Temperature change at 300hPa (c. 9 km height) between 20oN and 20oS since 1979, according to HadAT. The thin blue line shows the monthly values, while the thick blue line represents the simple running 37 month average, nearly corresponding to a running 3 yr average. The stippled red line shows the linear fit for the period shown, with basic statistics shown in the upper left corner of the diagram. The data were normalised by setting the average of their initial 120 months (10 years) from January 1979 to December 1988 = 0. Last month shown: December 2012. Last diagram update: 4 May 2013. Temperature change at surface between 20oN and 20oS since 1979, according to HadCRUT4. The thin blue line shows the monthly values, while the thick blue line represents the simple running 37 month average, nearly corresponding to a running 3 yr average. The stippled red line shows the linear fit for the period shown, with basic statistics shown in the upper left corner of the diagram. The data were normalised by setting the average of the initial 120 months (10 years) from January 1979 to December 1988 = 0. Last month shown: April 2013. Last diagram update: 8 June 2013. Click here to download the entire HadCRUT3 series since 1850. The initial versions of satellite and radiosonde datasets suggested that the tropical surface had warmed more than the troposphere, while climate models consistently showed tropospheric amplification of surface warming in response to human-caused increases in well-mixed greenhouse gases, as shown by the diagrams above. This observation gave rise to deep concern, and resulted in a number of studies (e.g. NRC 2000) where strong attempts were made to find warming in the troposphere. As new data sets have been made available and new corrections introduced, the scientific literature have witnessed a number of attempts of reconciling the modelled and the observed atmospheric warming pattern. Conflicting conclusions have, however, been reached. Some scientists conclude that a discrepancy between modelled and observed trends in tropical lapse rates still exists, while other argue that there is no longer a serious discrepancy. A few key references on this debate are represented by Lindzen 1999 and 2007, NRC 2000, Douglass et al 2007, and Santer et al 2008. Ongoing web-based discussions can be followed here and here. This debate reflects the importance of the point raised by Lindzen (1999) on monitoring temperature changes at the height in the troposphere corresponding to an infrared optical depth near 1. Diagram showing observed linear decadal temperature change at surface, 300 hPa and 200 hPa, between 20oN and 20oS, since January 1979. Data source: HadAT and HadCRUT4. Click here to compare with modelled altitudinal temperature change pattern for doubling atmospheric CO2. Last month included in analysis: December 2012. Last diagram update: 4 May 2013. The three diagrams above (using data from HadAT and HadCRUT4) show the linear trend of the temperature change since 1979 between 20oN and 20oS to be ca. 0.00089oC/month at the surface, 0.00095oC/month at 300 hPa, and -0.00009oC/month at 200 hPa, corresponding to 0.10698, 0.11414 and -0.01022oC/decade, respectively (see bar chart above). Thus, these radiosonde and surface meteorological data from the Equatorial region do not at the moment display the signature of enhanced greenhouse warming. With the observed warming rate of about 0.10698oC/decade at the surface, a warming rate of about 0.21-0.31oC/decade would have been expected at the 200 and 300 hPa levels to comply with the prognosis on this derived from the CO2 hypothesis. Weekly absolute (above) and anomaly (below) outgoing long wave radiation (OLR) at the top of the atmosphere 1 - April March 2019. Base period January 1981 - December 2010. Source: National Oceanographic and Atmospheric Administration (NOAA) Earth System Research Laboratory (ESRL). Last diagram update: 9 April 2019. Click here to see the original ESRL diagram showing OLR absolute values, or to check for a more recent diagram. Click here to see the original ESRL diagram showing OLR anomaly values, or to check for a more recent diagram. First of all, it should be noted that the above maps are Mercator projection maps, whereby the polar regions are visually highly exaggerated as to their apparent surface area. In reality, it is the regions near Equator which are important as to the real surface area. The general long wave (infrared) pattern is characterised by a gradient towards relatively low values at high latitudes, and higher values near the Equator (upper panel). This zone of relative high long wave radiation follows the sun throughout the seasons, being displaced north during the Northern Hemisphere summer, and vice versa during the Northern Hemisphere winter. The strongest contrast within latitudinal belts exist in the low latitudes, where the high outgoing radiation of the subtropical anticyclones (high pressure zones) and other dry zones contrast sharply with the low outgoing radiation of the major cloudy regions of the tropics. Also at middle latitudes there may be substantial longitudinal variations, particular in the Northern Hemisphere. Such variations are often caused by massive penetration of cold air from the polar regions to middle latitudes, associated with strong blocking patterns in higher latitudes (Gruber and Winston 1978), and are most frequently observed in the Northern Hemisphere during Northern Hemisphere winter. Average total (left) and anomaly (right) outgoing long wave radiation (OLR) between 10oN and 10oS at the top of the atmosphere, since 8 April 2018 (top of diagram). Base period January 1981 - December 2010. Source: National Oceanographic and Atmospheric Administration (NOAA) Earth System Research Laboratory (ESRL). Last day shown: 7 April 2019 (bottom of diagram). Last diagram update: 9 April 2019. The region near the Equator is of high importance because of the huge surface areas involved. Variations are seen to be especially large within the region 60oE-120oW, covering the Indian Ocean, Indonesia and most of the Pacific Ocean between 10oN and 10oS. The red area of the Sun's spectrum (upper panel in figure above) is absorbed by the atmosphere and the Earth's surface. The warmed surface emits infrared radiation as indicated by the white areas on the individual molecule's spectrum (lower panels). The grey bits are the parts of the spectra that are absorbed by the atmosphere. The blue area on the Earth's emission spectrum (upper panel) is known as the infrared window through which most of the Earth's radiation passes to space unhindered by being absorbed by any of the greenhouse gases. This short text is from Barett Bellamy Climate, where a more thorough description of the greenhouse effect is provided. The diagrams below all show infrared radiation within this window. Outgoing longwave radiation (OLR) at the top of the atmosphere between 180oW and 179oE (0oE and 359.5oE) and 90oN and 90oS since June 1974 according to the National Oceanographic and Atmospheric Administration (NOAA). The thin blue line represents the monthly value, while the thick red line is the simple running 37 month average, nearly corresponding to the running 3 yr average. The infrared wavelength covered is 10.5-12.5 µm (Gruber and Winston 1978) and covers the main part of the atmospheric infrared window. Last month shown: October 2010. Last diagram update: 13 February 2011. Click here to download the entire series of NOAA monthly OLR-values since June 1974. Choose first 'OLR' then 'Select field'. Scatter plot showing outgoing longwave radiation (OLR) at the top of the atmosphere between 180oW and 179oE (0oE and 359.5oE) and 90oN and 90oS since June 1974, as function of atmospheric CO2. OLR data from the National Oceanographic and Atmospheric Administration (NOAA). CO2 data measured at the Mauna Loa Observatory, Hawaii, reported as a dry mole fraction defined as the number of molecules of carbon dioxide divided by the number of molecules of dry air (water vapour removed), multiplied by one million (ppm). The red line represent a two-degree polynomial fit, specified in the lower left corner of the diagram. As the amount of atmospheric CO2 has been increasing over the entire period (ignoring annual variations), the x-axis can be seen as as rough timeline from 1974 (left) to 2010 (right). The infrared wavelength covered is 10.5-12.5 µm (Gruber and Winston 1978) and covers the main part of the atmospheric infrared window. Last month shown: October 2010. Last diagram update: 13 February 2011. Diagram showing outgoing longwave radiation (OLR) at the top of the atmosphere between 180oW and 179oE (0oE and 359.5oE) and 90oN and 90oS since December 1978 ( red line; National Oceanographic and Atmospheric Administration (NOAA), and the global monthly average lower troposphere temperature (blue line; University of Alabama at Huntsville, USA). The thin lines represent the monthly values, while the thick lines are the simple running 37 month averages, nearly corresponding to running 3 yr averages. The infrared wavelength covered is 10.5-12.5 µm (Gruber and Winston 1978) and covers the main part of the atmospheric infrared window. Last month shown: October 2010 (OLR) and January 2011 (UAH). Last diagram update: 13 February 2011. Outgoing longwave radiation (OLR) at the top of the atmosphere between 180oW and 179oE (0oE and 359.5oE) and 20oN and 20oS since June 1974 according to the National Oceanographic and Atmospheric Administration (NOAA). The thin blue line represents the monthly value, while the thick red line is the simple running 37 month average, nearly corresponding to the running 3 yr average. The infrared wavelength covered is 10.5-12.5 µm (Gruber and Winston 1978) and covers the main part of the atmospheric infrared window. Last month shown: October 2010. Last diagram update: 13 February 2011. Scatter plot showing outgoing longwave radiation (OLR) at the top of the atmosphere between 180oW and 179oE (0oE and 359.5oE) and 20oN and 20oS since June 1974, as function of atmospheric CO2. OLR data from the National Oceanographic and Atmospheric Administration (NOAA). CO2 data measured at the Mauna Loa Observatory, Hawaii, reported as a dry mole fraction defined as the number of molecules of carbon dioxide divided by the number of molecules of dry air (water vapour removed), multiplied by one million (ppm). The red line represent a two-degree polynomial fit, specified in the lower left corner of the diagram. As the amount of atmospheric CO2 has been increasing over the entire period (ignoring annual variations), the x-axis can be seen as as rough timeline from 1974 (left) to 2010 (right). The infrared wavelength covered is 10.5-12.5 µm (Gruber and Winston 1978) and covers the main part of the atmospheric infrared window. Last month shown: October 2010. Last diagram update: 13 February 2011. Diagram showing outgoing longwave radiation (OLR) at the top of the atmosphere between 180oW and 179oE (0oE and 359.5oE) and 20oN and 20oS since December 1978 ( red line; National Oceanographic and Atmospheric Administration (NOAA), and the global monthly average lower troposphere temperature (blue line; University of Alabama at Huntsville, USA). The thin lines represent the monthly values, while the thick lines are the simple running 37 month averages, nearly corresponding to running 3 yr averages. The infrared wavelength covered is 10.5-12.5 µm (Gruber and Winston 1978) and covers the main part of the atmospheric infrared window. Last month shown: October 2010 (OLR) and January 2011 (UAH). Last diagram update: 13 February 2011. Outgoing longwave radiation (OLR; red graph) anomaly at the top of the atmosphere above Equator between 160oE and 160oW since 1979 according to the National Oceanographic and Atmospheric Administration (NOAA) Climate Prediction Center (CPC). Base period: 1979-1995. Surface air temperature change (blue graph) between 20oN and 20oS since 1979, according to HadCRUT3. The thin lines represent the monthly values, while the thick lines is simple running 37 month averages, nearly corresponding to running 3 yr averages. Within the time period 1996-2009, light blue areas indicate periods of surface cooling, and light red areas indicate surface warming. The entire OLR data series goes back to June 1974, but is here shown from January 1979 to enable easy comparison with the temperature diagrams shown above. The infrared wavelength covered is 10.5-12.5 µm (Gruber and Winston 1978) and covers the main part of the atmospheric infrared window. Last month shown: January 2011 (OLR) and December 2010 (HadCRUT3). Last diagram update: 12 February 2011. Click here to download the entire series of NOAA monthly OLR-values since June 1974. For the equatorial region, the diagram above suggests a certain chain of events, indicating the existence of a mechanism regulating the surface temperature: Periods of surface warming appears initially to be associated with decreasing outgoing longwave radiation (OLR). After some surface warming, OLR then stops decreasing and instead begins to increase, and after a while, surface air temperature then begins to decrease, etc. This chain of events is clearly illustrated by, e.g., the time period around the 1998 El Niño event (diagram above). Part of the explanation of the above succession of events might be that tropical surface warming leads to enhanced atmospheric convectional transport of heat to high levels of the atmosphere above the Equator, resulting in enhanced longwave radiation at the top of the atmosphere. This, in turn, eventually leads to surface cooling, which results in reduced atmospheric convection, etc. Also the potential connection to variations in tropical sea surface temperatures and the tropical cloud cover is interesting, and should be considered in a more detailed analysis. Outgoing longwave radiation (OLR) at the top of the atmosphere between 180oW and 179oE (0oE and 359.5oE) and 70oN and 90oN since June 1974 according to the National Oceanographic and Atmospheric Administration (NOAA). The thin blue line represents the monthly value, while the thick red line is the simple running 37 month average, nearly corresponding to the running 3 yr average. The infrared wavelength covered is 10.5-12.5 µm (Gruber and Winston 1978) and covers the main part of the atmospheric infrared window. Last month shown: October 2010. Last diagram update: 13 February 2011. Scatter plot showing outgoing longwave radiation (OLR) at the top of the atmosphere between 180oW and 179oE (0oE and 359.5oE) and 70oN and 90oN since June 1974, as function of atmospheric CO2. OLR data from the National Oceanographic and Atmospheric Administration (NOAA). CO2 data measured at the Mauna Loa Observatory, Hawaii, reported as a dry mole fraction defined as the number of molecules of carbon dioxide divided by the number of molecules of dry air (water vapour removed), multiplied by one million (ppm). The red line represent a two-degree polynomial fit, specified in the lower left corner of the diagram. As the amount of atmospheric CO2 has been increasing over the entire period (ignoring annual variations), the x-axis can be seen as as rough timeline from 1974 (left) to 2010 (right). The infrared wavelength covered is 10.5-12.5 µm (Gruber and Winston 1978) and covers the main part of the atmospheric infrared window. Last month shown: October 2010. Last diagram update: 13 February 2011. Diagram showing outgoing longwave radiation (OLR) at the top of the atmosphere between 180oW and 179oE (0oE and 359.5oE) and 70oN and 90oN since December 1978 ( red line; National Oceanographic and Atmospheric Administration (NOAA), and the global monthly average lower troposphere temperature (blue line; University of Alabama at Huntsville, USA). The thin lines represent the monthly values, while the thick lines are the simple running 37 month averages, nearly corresponding to running 3 yr averages. The infrared wavelength covered is 10.5-12.5 µm (Gruber and Winston 1978) and covers the main part of the atmospheric infrared window. Last month shown: October 2010 (OLR) and January 2011 (UAH). Last diagram update: 13 February 2011. Outgoing longwave radiation (OLR) at the top of the atmosphere between 180oW and 179oE (0oE and 359.5oE) and 70oS and 90oS since June 1974 according to the National Oceanographic and Atmospheric Administration (NOAA). The thin blue line represents the monthly value, while the thick red line is the simple running 37 month average, nearly corresponding to the running 3 yr average. The infrared wavelength covered is 10.5-12.5 µm (Gruber and Winston 1978) and covers the main part of the atmospheric infrared window. Last month shown: October 2010. Last diagram update: 13 February 2010. Scatter plot showing outgoing longwave radiation (OLR) at the top of the atmosphere between 180oW and 179oE (0oE and 359.5oE) and 70oS and 90oS since June 1974, as function of atmospheric CO2. OLR data from the National Oceanographic and Atmospheric Administration (NOAA). CO2 data measured at the Mauna Loa Observatory, Hawaii, reported as a dry mole fraction defined as the number of molecules of carbon dioxide divided by the number of molecules of dry air (water vapour removed), multiplied by one million (ppm). The red line represent a two-degree polynomial fit, specified in the lower left corner of the diagram. As the amount of atmospheric CO2 has been increasing over the entire period (ignoring annual variations), the x-axis can be seen as as rough timeline from 1974 (left) to 2010 (right). The infrared wavelength covered is 10.5-12.5 µm (Gruber and Winston 1978) and covers the main part of the atmospheric infrared window. Last month shown: October 2010. Last diagram update: 13 February 2011. Diagram showing outgoing longwave radiation (OLR) at the top of the atmosphere between 180oW and 179oE (0oE and 359.5oE) and 70oS and 90oS since December 1978 ( red line; National Oceanographic and Atmospheric Administration (NOAA), and the global monthly average lower troposphere temperature (blue line; University of Alabama at Huntsville, USA). The thin lines represent the monthly values, while the thick lines are the simple running 37 month averages, nearly corresponding to running 3 yr averages. The infrared wavelength covered is 10.5-12.5 µm (Gruber and Winston 1978) and covers the main part of the atmospheric infrared window. Last month shown: October 2010 (OLR) and January 2011 (UAH). Last diagram update: 13 February 2011. Diagram showing the HadCRUT4 estimate for the global annual surface temperature anomaly since 1885, and the average annual excess of duration of the day, defined as the difference between the astronomically determined duration of the day and 86400 seconds, and also called the length of day (LOD). The thin lines are showing the annual values, and the thick lines are the running 11 yr average. Temperature data source: the Hadley Centre for Climate Prediction and Research and the University of East Anglia's Climatic Research Unit (CRU), UK. LOD data source: International Earth Rotation and Reference Systems Service (IERS). Last year shown: 2016. Last diagram update: 3 March 2018. Click here to download the entire series of HadCRUT4 global monthly surface air temperature anomaly data since 1850. Click here or here to download the annual LOD data from the International Earth Rotation and Reference Systems Service. Click here to read more about how to measure the irregularities of planet Earths rotation. Diagram showing the monthly HadCRUT4 estimate for the global surface temperature anomaly since January 1962 (upper panel), the average angular velocity of Earth (mid panel), and the average monthly excess of duration of the day (lower panel). The excess duration of the day (LOD) is defined as the difference between the astronomically determined duration of the day and 86400 seconds. The thin lines are representing the monthly values, and the thick lines are the running 37 month average (about 3 yr). Temperature data source: the Hadley Centre for Climate Prediction and Research and the University of East Anglia's Climatic Research Unit (CRU), UK. Angular velocity and LOD data source: International Earth Rotation and Reference Systems Service (IERS). Last month shown: May 2017. Last diagram update: 3 March 2015. Click here or here to download the LOD data from the International Earth Rotation and Reference Systems Service. The length of day (LOD) as shown above are subject to variations due to variations in oceanic tides (smaller than 0.03 ms in absolute value), variations in the atmospheric circulation, and to internal effects and to transfer of angular momentum to the Moon orbital motion. Also the dynamical influence of the liquid core of the earth may account for slow variations, but then generally expressed as overall long-term trends (Akoi et al. 1982). Zatman and Bloxham (1997) found that torsional oscillations have their sources at the outer-inner core boundary of earth. Duhau and de Jager (2012) found semi-secular (40-60 yr) oscillations in LOD to be linearly related to cycles in solar orbital parameters, and that the semi-secular LOD oscillations presumably are exited by planetary orbital motions, especially Jupiter and Saturn. The above diagrams show that periods with relatively high planetary rotation velocity (and low LOD) tend to be associated with relatively warm periods, and vice versa. Good examples are the peak of LOD in the early 20th century, concurrent with the last cold spell of The Little Ice Age and the loss of Titanic. Also the cold period 1965-1977 was associated with long day length (high LOD) and low planetary angular velocity. The generally increasing rotation velocity of Earth (and decreasing LOD) since then has taken place along with the period of late 20th century warming. Variations in LOD has also been associated with the Atmospheric Circulation Index (ACI) and variations in commercial catches of different fish species. Some of these associations are thoroughly described and discussed by Klyashtorin and Lyubushin (2007).